... Chronology of the U.S. Brewing Industry From "American Breweries II." ... Beer Barons The German-American brewery magnates. ... Beer & Television A brief history of beer commercials. ... George Ehret's Hell Gate Brewery Once America's largest brewery..
... Diary of a 19th Century Brewmaster In his own words. ... William Penn & Beermaking In Colonial Pennsylvania. From "Brewed In America." ... D. G. Yuengling & Son. America's Oldest Brewery, established 1829. ... King Gambrinus. AKA: "The King of Beer." Who was he? ... The Patron Saints of Beer. An article by the Brews Brothers. ... George Washington: President & Beer Lover. From "Brewed In America." ... George Washington's Beer Recipe. Read his personal recipe for beer. ... The Six-Point Brewer's Star. What does it mean? ... Kansas City Breweries: A Historic Driving Tour. ... Adolphus Busch: King of Beer. Five-part feature article about Adolphus Busch. ... Der Sternewirth. Every 19th century brewery had one. ... 1879: The Year In Beer. A few interesting stats on brewing in 1879. ... Shakeout in the Brewing Industry. Consolidation of brewing 1950-1980. ... A. Gettelman Brewing Company. History brochure produced in 1954. ... Miller Brewing Company. History brochure published by the brewery. ... Traveling Billboards. A novel advertising medium. ... Miss Rheingold Contest. From Will Anderson's Beer To Eternity. ... Originators of Rheingold Beer. An article by By Rolf Hofmann. ... Texas' First Brewery. A visit to the enchanted ruins. ... Story of Black Pride Beer. As told in a 1969 Brewers Digest feature. ... Frank Jones Brewing Co. From Will Anderson's Beer New England. ... The Giant That Was Narragansett. From Will Anderson's Beer New England. ... F&M Schaefer Brewing Co. From Will Anderson's Breweries of Brooklyn. ... Concise Timeline of Beer History. By Prof. Linda Raley, Texas Tech Univ. ... Top 10 in 1997. Barrelage of U.S. top 10 brewers in 1997. ... Production of U.S. Breweries 1863-1994. A chart showing annual barrelage. ... The Brewing Process. As shown in a 1950s USBF brochure. Excerpts from the book, "Brewing Beer In The Buckeye State, Volume I"
by Dr. Robert A. Musson. ... Consumers Brewing Co., Newark, Ohio A look at "the brewing capital of the world." ... Simon Linser Brewery, Zanesville, Ohio The brewery merger craze of the late 1800s. 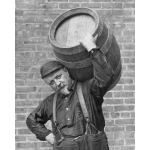 ... Schuster Brewing Co., Massillon, Ohio Life as a 19th-century brewery worker. ... Why Milwaukee? A look at "the brewing capital of the world." ... The British Are Coming! The brewery merger craze of the late 1800s. ... Labor In The Brewery. Life as a 19th-century brewery worker. ... Adolphus Busch: Captain of Industry. Lifestyle of a Beer Baron. ... The Saloonkeeper. Saloons were the brewer's lifeblood. ... Wagner Brewing Co. (Illinois) by Donald Roussin & Kevin Kious. ... Wm. J. Lemp Brewing Co. by Donald Roussin & Kevin Kious. ... Mascoutah Brewing Co. (Illinois) by Donald Roussin & Kevin Kious. ... Diamond State Brewery (Wilmington, Delaware) by John Medkeff. ... Arizona Brewing Company by Ed Sipos. ... History of Brewing in Steubenville, Ohio. ... The Diehl Brewery in Defiance, Ohio. ... Breweries of Tuscarawas County, Ohio. ... Beer-making in Portsmouth, Ohio. ... Marion Brewing & Bottling Co., Marion, Ohio.